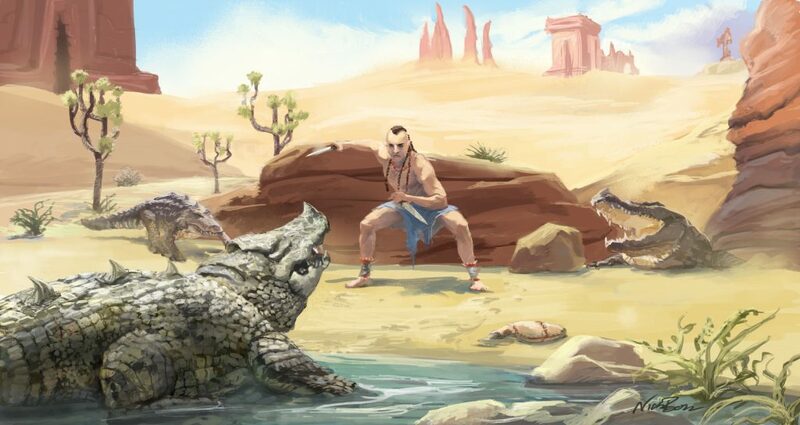 Throughout June we organized a fan art and fan fiction contest, inviting the creators in the Conan Exiles community to send in their best work to win a copy of the game signed by the development team. Considering all the amazing entries we got from our players it was incredibly difficult to choose a winner, but eventually we managed to land on our favorite piece of fiction and fan art. Fan Art Winner: Nick B. Artist Nick B, sent us this incredible drawing of a young warrior facing down three crocodiles with only two daggers in his fists. The amount of detail in this picture absolutely blew us away. The more you look at it, the more you notice in both the background and the foreground. This truly captures the Conan Exiles experience. A place of exiles tied down to a hateful earth, of old inhuman races that claw against sides of graves, while descending into abyss. A Hell which a Pict, a people that many dark milenia declined into endemic tribal war and had left under blackest sorceries, would scratch out survival in. Zahrim of the Crab Clan of Picts, from the Western Ocean’s shore, crouched within tall grass and bush. He’d come to be in a lush river delta valley, with stalking Darfari hunters trying to make sport of him. Zahrim’s pursuers too long preyed on an abundance of domesticated exiles, and it dulled their instincts for hunting those not disarmed of true nature by the cruelty of civility and its false securities. One of the last hunters crossed shallow stream under moonlight near a waterfall, carelessly stepping. Twine tripwire released stick arm, driving serrated and carved bone into the cannibal’s thigh. Dark blood gushed from the wound, as flesh ripped about with the spike’s toothed edges, and stayed impaled in his flesh. An anguished cry came from the trap’s victim, his life’s blood flowed without slowing, an exodus from his body till he was soon dead with its loss. Another Darfari ran to him, as cries of panic still echoed in the night, her growls of intimidation against the darkness cut short, as a stone spear edge thrashed through her neck from her blind side. She saw all going inkwell black, except a ghost of mud covered silhouette quickly crossing her fading view without a sound. Taking her last slow steps forward, hands raised in futility to what remained of her throat, cascades of crimson flowed down over her bare and ebony skin tone chest, before she succumbed and collapsed with a bloody gurgling whimper. Of the Darfari, Zahrim had learned some from pirate’s tales. Coastal Picts, while spoken of has being the wildest in Zingara, still engaged in trade with passing ships when it suited them. From the lands south of Kush and Stygia, prized ostrich feathers and plumes came to the Picts, in return for the various needs of fresh water, food, copper ore, and timbers the pirates and buccaneers desperate enough to lay anchor and risk contact with the clans would seek. Zahrim’s foreknowledge of these cannibals had not however helped his only companion since arriving in the Exiled Lands, Dascha. The Pict went murderous cold with thinking of her, and her end. Dascha the half Pict and Aquilonian slave dancer, from the shores of the Aquilonian frontier on Thunder River. Zahrim had been caged with her at the Darfari’s camp. Her screams as living flesh rapidly cooked off from bone in the boiling oily broth, when she was chucked into the Darfari’s massive black iron cauldron feet first, making her a sacrifice to their god Yog, a demon lap dog of Set if Stygian sailors were to be believed. In his time with Dascha, Zahrim had started to learn of Derketo, a deity that had stirred up a sense of piety in him with her domain over fertility and death, and the passions that join them. Over the course of several days since his escape, Zahrim had also learned much of his surroundings in the Exiled Lands, as he fled from his pursuers deeper into the river valley. He had even journeyed up the stone cliff sides, to the edge of a haunted and long corrupted city where all manner of undead and horrors dwelled, and all living and sanity had fled. Yet the cannibal savages had maintained the hunt, till now. The last of them, a sole Darfari stalker, was now realizing he was alone on the river’s shores, alone with a savage equal in ferocity and lethality to any of his own race. With no pause, the last hunter turned and started south, toward where he knew a friendly tribe of his kinsmen had a camp on the water’s edge. The hunt for the Pict would begin again, with fresh pursuers, better prepared for the task of bringing this ‘long pig’ down and to a feast in Yog’s honor. Not knowing Pictish, but startled by hearing Zahrim’s voice, the Darfari stopped, weary of his prey’s tricks. In the dark he looked all about him, stepping slowly, until he felt and heard a crunch under his foot. Small bones, branches, and left overs of plant stalks from making twine littered the ground along with game animal carcasess. The creatures had not been killed in the manner of a tribal though. They were shriveled, dry husk, drained. In complete panic the Darfari too late had realized what the Pict had hearded him into. He turned to run, but heard as the makeshift cage was sprung and the scamper of merciless legs of chiton came forward, out from under where it had been concealed below branches and grass. Whether the Darfari could even hear Zahrim’s low, monotone voice did not even matter to the Pict. He was more speaking to himself as he crouched from his place up in the trees, and watched as the full moon emerged from behind the clouds to reveal the sight of the cannibal being brought down by the massive man sized black spider, with red stripes down its back. With the Darfari’s dying screams, Zahrim knew the game was ended, and the business of starting life again here in the Exiled Lands could begin. He would start with tracking down the Cimmerian, the first soul he had encountered since coming here. ← The Jewel of the West Pack is now available!